Les Damon stars in this collection of sixteen fast-moving adventures. 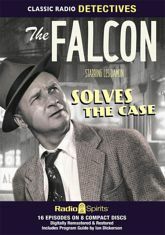 With a little bit of a hard-boiled edge, a little bit sarcasm, and a whole lot of charm, The Falcon solves crimes, helps the helpless, and makes time with femmes-fatale all in equal measure. Includes a Program Guide by Ian Dickerson.